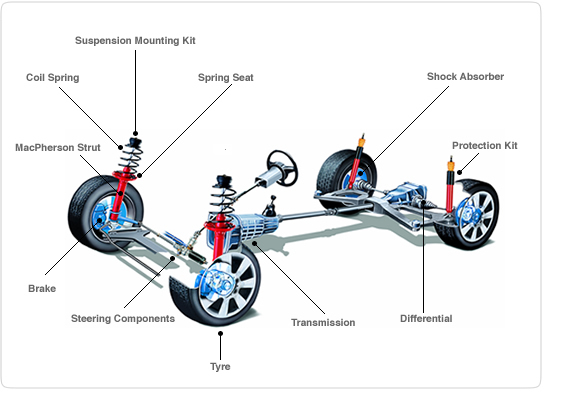 A vehicles suspension is made up of three components, the tyre, the spring and the shock absorber. All three components need to be in good working order to keep the tyre properly in contact with the road. The basic function of a shock absorber is to keep the vehicles tyres in contact with the road. The shock absorber regulates the movement of the spring and is the final crucial link in ensuring a smooth and more importantly safe ride. Even with new tyres and new brakes, unless all shock absorbers are in good working order vehicle safety is compromised because of reduced wheel contact with the road. With springs but no shock absorbers, the vehicle is able to absorb bumps, but the undampened suspension means that the vehicle continues to bounce and causes the tyres to leave the road. With springs and shock absorbers, the vehicle not only absorbs bumps but also the shock absorbers dampen the springs and prevent the vehicle from bouncing. Shock absorbers and coil springs are subjected to the elements like rain, dirt and salt from the roads. This can lead to corrosion and weakened performance. They should therefore be checked every 30,000km and replaced every 80,000km. You might also be interested in Why is it Important to Have Your Wheel Alignment Checked Annually?